"The Drowned Celestial," by Lavie Tidhar [bio] (edited by George R.R. 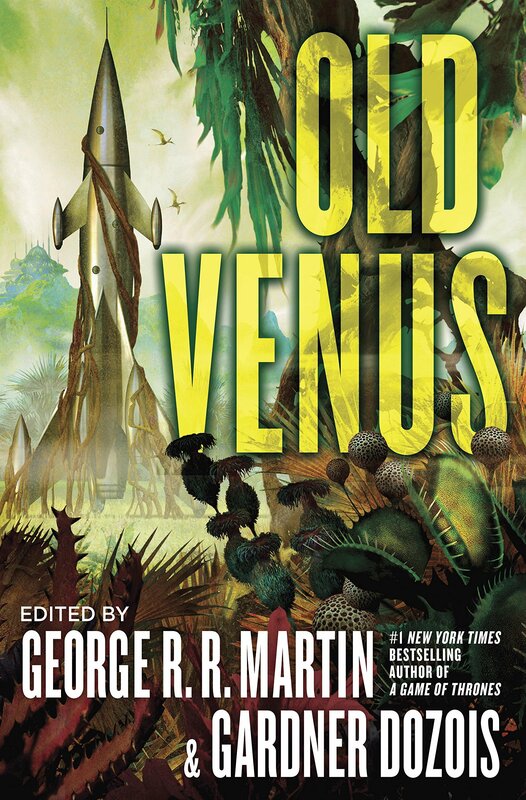 Martin and Gardner Dozois), appeared in Old Venus (RSR review), published on March 6, 2015 by Titan Books. Pro: Pretty much non-stop action, written in the style of thrillers from 70 years ago. Fittingly, Colt doesn't end up with a treasure--just an adventure. Atypically, he also ends up with a boyfriend. Lots of cute references to characters from Heinlein and others. We pretty much knew the Sun Eater will end up rescuing Colt and Sharol, but the actual way it happens is still a surprise. Con: Not written to be taken seriously, it doesn't make you feel much tension. It's a fun read, but a shallow one. The story is riddled with what appear to be editing errors. E.g. "Once Europa had sang with the mind-song of ... ."